Every May 12th, we celebrate the women who brought us into this world and cared for us over the years. We fully support Mother’s Day as a national holiday, but we think everyday should celebrate our mothers. We created this “I Heart Mom” arrangement of sunny yellow roses, cymbidium orchids, ranunculus, viburnum, and lemons still on the branch. Our birch bark vase with carving, made famous by Martha Stewart’s Good Things, now simply says “MOM”. 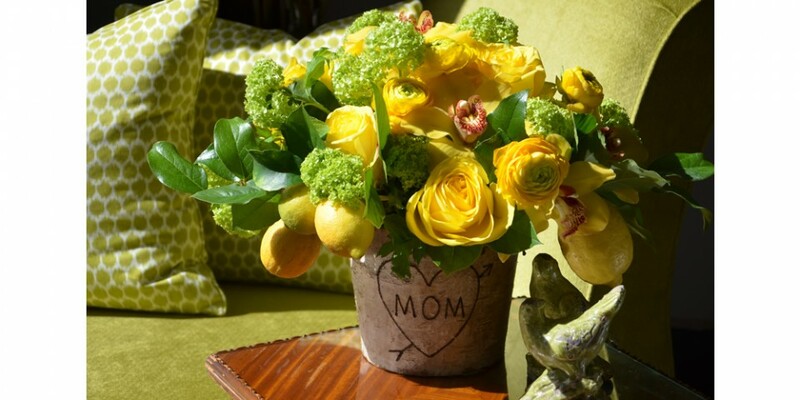 This joyful arrangement let’s mom know she is the sunshine of your life.